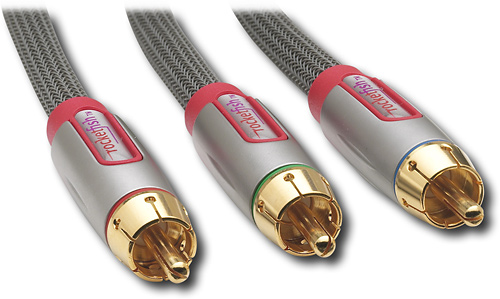 All of our Component Video Cables (Red/Green/Blue) are made up of 75ohm Coaxial Cable to give the best video signal possible. These are RG59 Coaxial Cable, in both the 3 RCA and 5 RCA (with audio) configurations. The Standard 3 RCA configuration is for Video Only, and the 5 RCA is made up of 3 Coaxial Cables, and 2 Shielded Audio Cables for great quality Analog Audio and Video. Although Component Video is capable of up to 1080p, most hardware still only uses 1080i on the component video ports. It's not a limitation of the cable, just the chips inside the devices.